Copyright © 2011-2012 David Velten. Powered by Blogger. After another soggy Spring that has extended into early Summer, I made a snap decision in May to go vertical and build myself a set of raised beds above the muck. This blog will attempt to document the successes and the, hopefully few, failures of that decision. I was wondering what kind of foliage season we would have given the extended drought, but it looks like it is going to be a knock-out. This sugar maple in the woods behind West Burial Grounds in Bolton is a traffic-stopper when the afternoon sun lights it up. The photo does not do it justice. 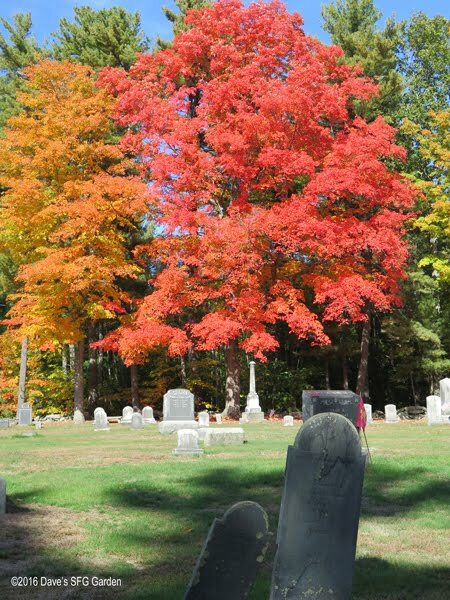 We are planning a trip Tuesday out to western Massachusetts to enjoy the foliage for ourselves, after being inconvenienced all weekend with the peepers out of Boston plugging up town roads. Hope they dropped a lot of $$ at the local orchards and farms. 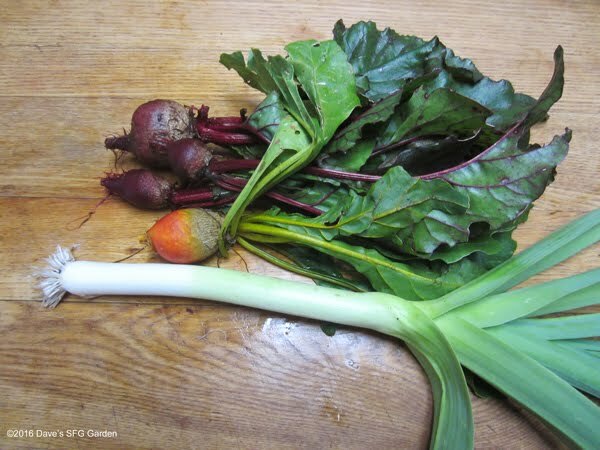 There is not much left in the garden except for the root vegetables. I pulled the last few beets and dug up a leek for Sunday dinner. I sliced the leek and some Jimmy Nardello peppers and mushrooms and sauteed them, then poached some flounder filets from our CSF on top of the vegetables. I harvested the first of the fall radish crop, with plenty more left in the ground. Since they grew in cooler weather, they were sweet can crispy with no heat. I would have liked to plant a few more things, but in August the garden was bone dry with temperatures around 100F/38C. The radishes germinate and grow quickly so I waited until temps cooled off and we got a little rain. We did not get frost at the house but at the garden, 2 miles away and downhill, we definitely had some kind of event. The tomatoes are all dead as are most of the peppers. The survivors are the ancho poblanos, which are still loaded with peppers, and the Hungarian paprika, but none of them are really happy. As happens every year, one killing freeze and now the weather is going to be balmy for weeks with a high on Tuesday of 80F/27C. This will be the last basket of tomatoes. A lot are green so we should be able to enjoy tomatoes in our salads for a few weeks. The other thing I planted in August that actually germinated was peas. These are Green Beauty snow peas and the cold weather did not bother them. 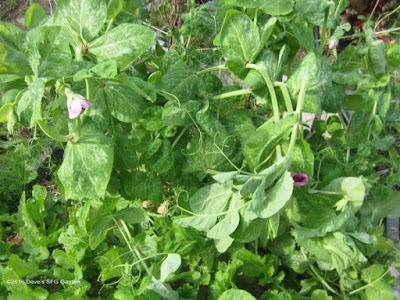 They are now flowering and maybe I will have a few peas to pick in a week. That is what happened in my neighborhood last week. To see what other gardeners around the world are doing, visit Dave at Our Happy Acres, our host for Harvest Monday. 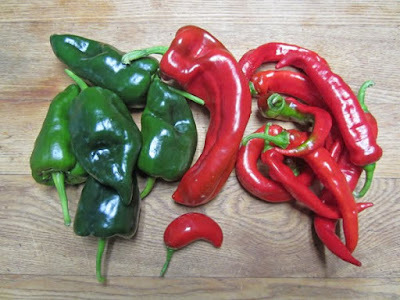 The weather has cooperated and I continue to get a few peppers. The ancho plants are loaded with small fruit so we could use a few more weeks of temperate weather to give them a chance to size up. And it would be nice to get some ripe Lemon Drop peppers, please. Still lots of cherry tomatoes. Boring but nice to have for salads and sauce. 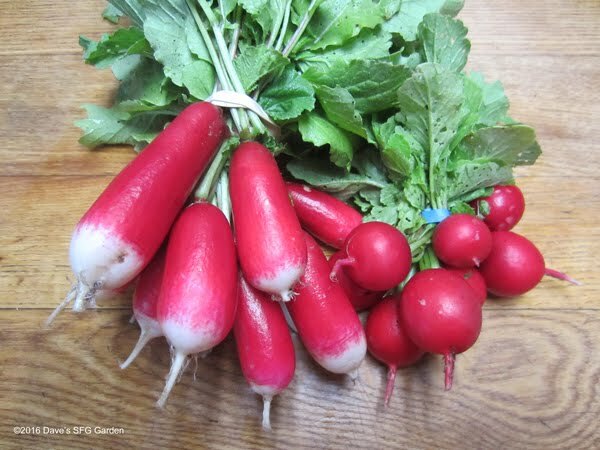 Elsewhere, the fall crop of radishes and peas are doing well. We have had a little rain, not enough to break the drought by any means but enough to be useful. I thought we might get some rain from Hurricane Matthew if it tracked up the coast, but then it did its crazy Ivan loop around. This week I have to start prepping the beds for the garlic and onions that will go in next week, so it would be nice if they were not bone dry to begin with. While watching TV, I heard a humming sound and banging on the house. This is what I found in the front yard, a wild turkey tag team wrestling match on my so-called lawn. I am assuming these are a group of young male turkeys (they all had wattles) practicing their judo moves before challenging the Head Tom. 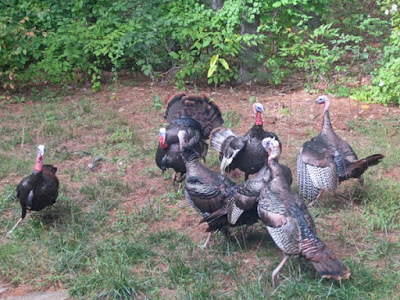 The banging noise came from two of the larger turkeys taking their wrestling match up the front stairs until they were banging into the door.This was certainly an interesting change from the group of hens and chicks that silently pass through the yard almost daily. 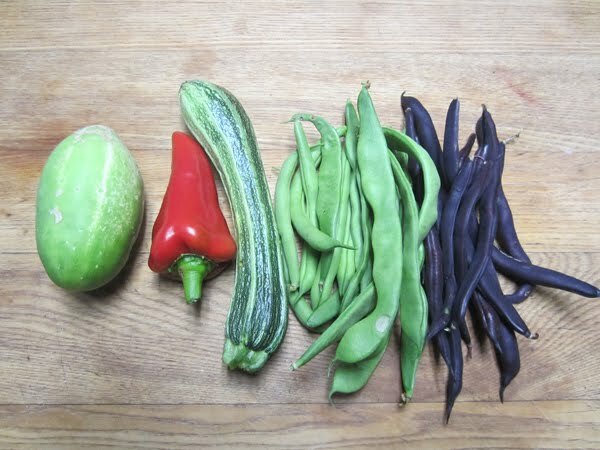 That's all that happened in my garden last week. 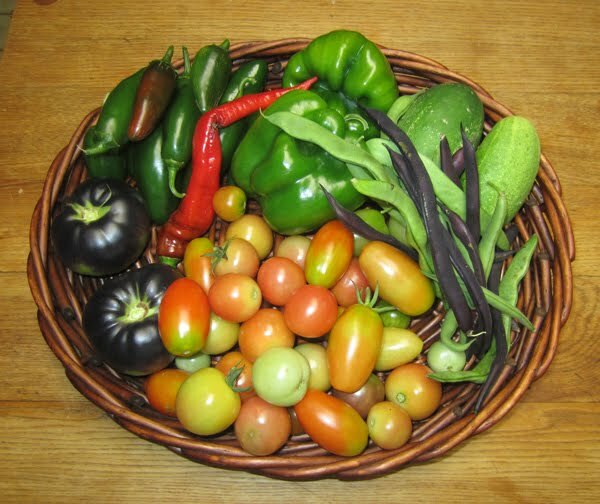 To see what other gardeners around the world are harvesting, visit Dave at Our Happy Acres, our host for Harvest Monday. 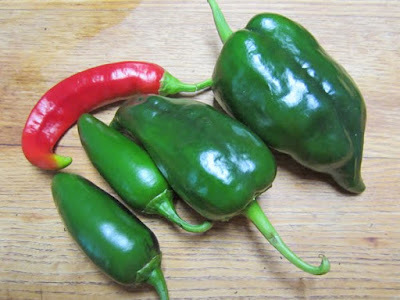 I finally got enough Ancho Poblanos to make a batch of chilies rellenos this week. The plants are a meter tall and very healthy, but unfortunately the weather is getting colder. 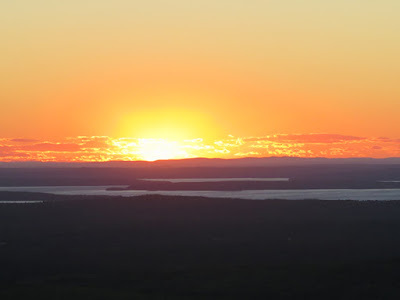 It is 40 F/4.5 C this morning, which is getting uncomfortably close to freezing. The mature pepper plants can endure a little cold weather as long as we don't have a killing frost. Seems we are never lucky in that respect. Also in the pile is a Melrose sweet red pepper, a pile of Jimmy Nardello, and a ripe jalapeno. 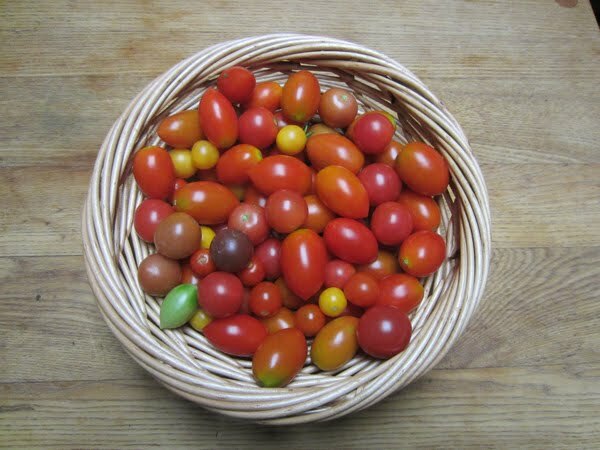 Another boring basket of cherry tomatoes. 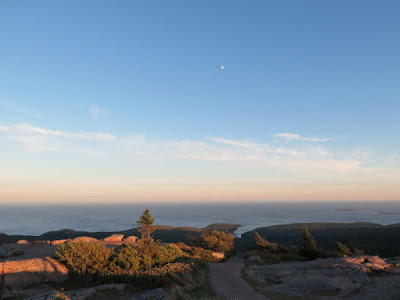 I already had a large number of these in the refrigerator from our Acadia trip. I ran out of time to process them so I threw two bags of them in the fridge, following Mark's lead. One bag was then slow roasted and frozen. The second bag went into the blender for gazpacho, along with onions, peppers, summer squash, and a chili. I used some of the suspect red onions I had set aside, the ones with the apparent bruise on the side. You can see the flat spot on the top of this onion. The spot is flat but does not seem soft. I don't remember dropping any of the onions, and even so the onions are rock hard and wouldn't show a mark unless they were whacked hard. In fact, they had these spots when they were harvested. On peeling the onion, you can see the black mold growing under the skin. So it was a good idea to set these aside and not put them in the onion storage bin. 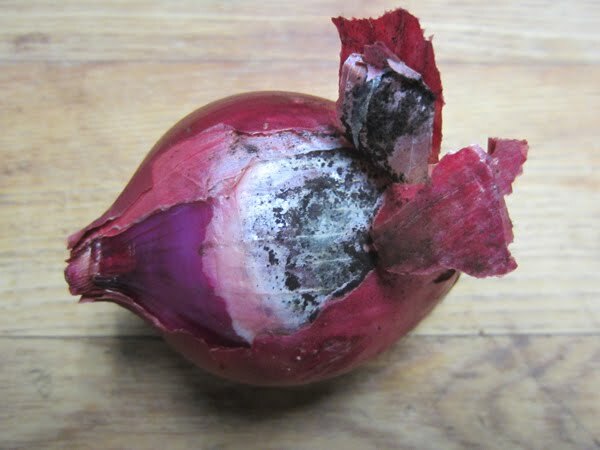 The mold must have caused the flat spots by collapsing the onion cells on the surface. 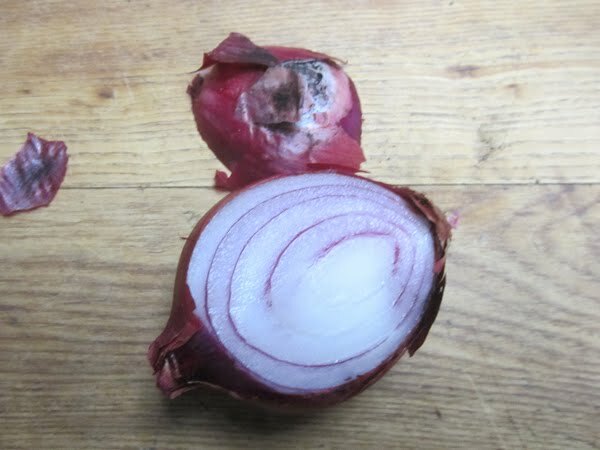 Slice off the infected spot and you can see the mold has not yet penetrated the interior of the onion, so the onion is still good. I only have a few more to use up. 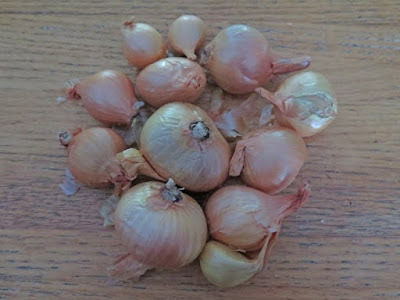 I also used garlic in the gazpacho and was disappointed to find some of the bulbs are already starting to soften and dry up. Unfortunately I just grabbed a bulb and did not notice which variety it was. From the same head, the two cloves at bottom right were white and juicy, the two at the top had yellowed and softened but were still used, and the clove on the left was brown and nasty and was tossed. So I have to get on with trying to preserve some more of the harvest this week. I plan to slice and dehydrate some, and I will also try roasting a number of whole heads and freezing them. I tasted one of the fermented cloves I made and it was eye opening. Very pungent but the clove was still firm and could be used in cooking. That is what happened in my garden last week. To see what other gardeners around the world are doing, visit Dave at Our Happy Acres, our host for Harvest Monday. 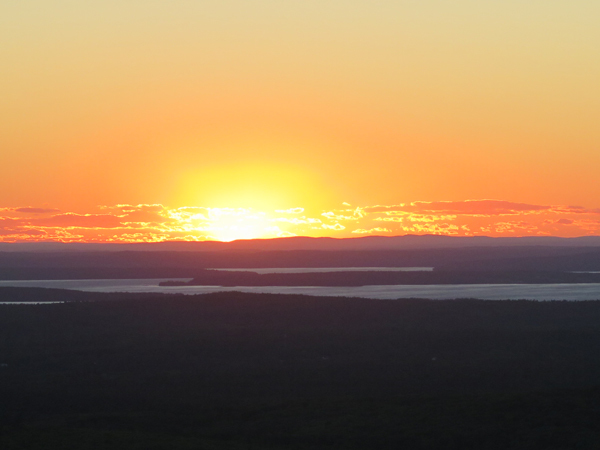 I missed Harvest Monday last week because we spent a week in a cabin on Somes Sound on Mount Desert Island, Maine, doing strictly non-gardening tasks, like watching the sunset from Cadillac Mountain in Acadia National Park. 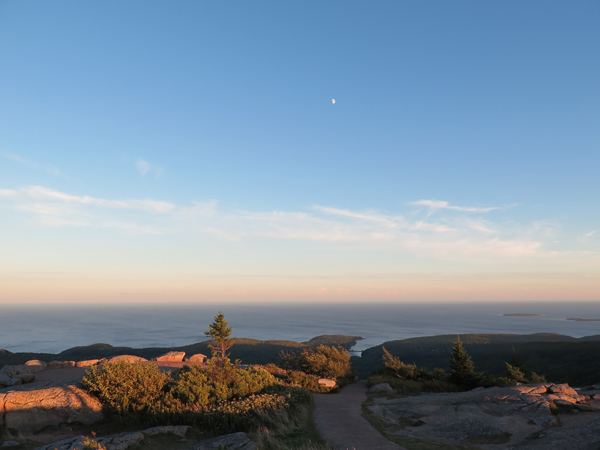 Or a little before the sun set, we watched the moon rise over the fog bank on Frenchman Bay from the other side of Cadillac. A storm front went through the day before and it was very cold and windy up there, so not a lot of flatlanders were around to spoil the picture. 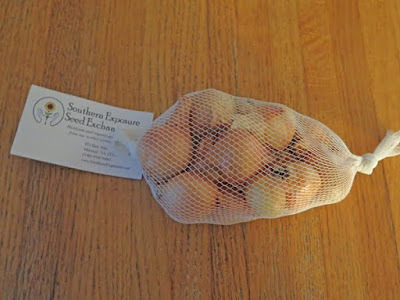 I have been interested in trying potato onions (also called multiplier onions, hill onions, mother onions, pregnant onions) and finally on impulse included some with my springtime seed order from Southern Exposure Seed Exchange. These got shipped in the Fall and my order arrived last week, a bit early for planting here but in time to prompt me to start my planning. 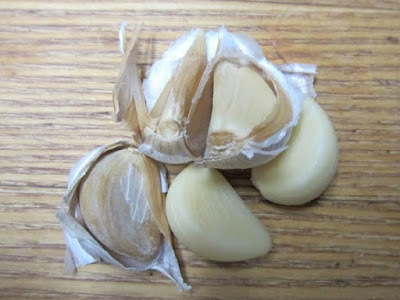 They keep well (8-10 months) so I don't have to worry and will plant them about the same time as I plant the garlic. 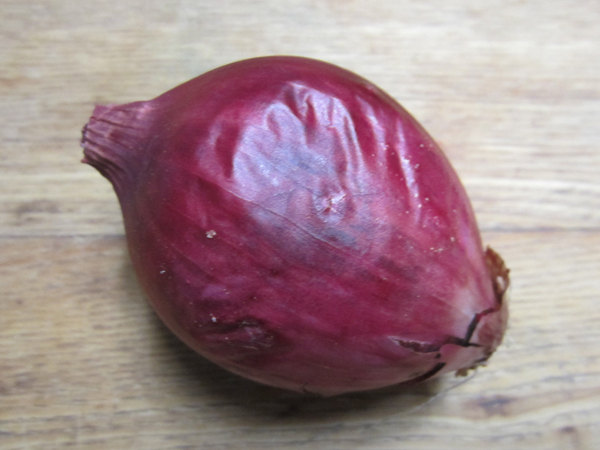 Potato onions, Allium cepa aggregatum, are similar to shallots, but larger. A single bulb, planted in the fall, emerges in the spring and eventually divides into a cluster of at least 3-5 bulbs, maybe even 10-12 bulbs, giving you a big "multiplier" effect. Potato onions are not grown commercially because they do not plant or harvest easily and are not suitable for commercial growers. But they are ideal for home growers. Despite that, they were almost lost, but SESE reintroduced a strain that dates back to 1790. The bag of onions I received was eight ounces (227 g) and the bulbs varied considerably in size. That is OK because potato onions do not grow like garlic, where you are always selecting for size. 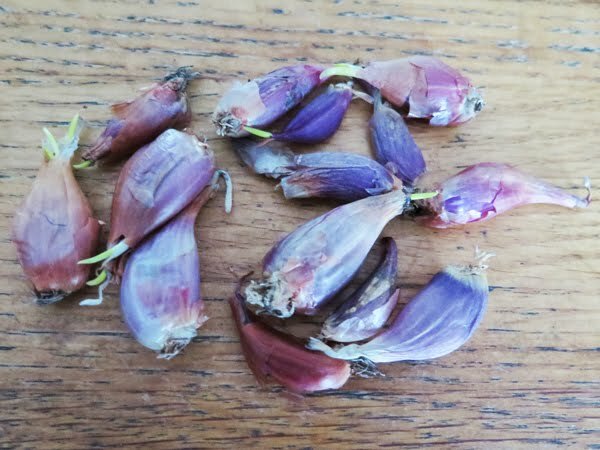 From what I have read, large seed bulbs will tend to produce a large number of smaller bulbs, while the smaller seed bulbs produce 2-3 large bulbs. So regardless I will wind up with a variety of sizes in the harvest. 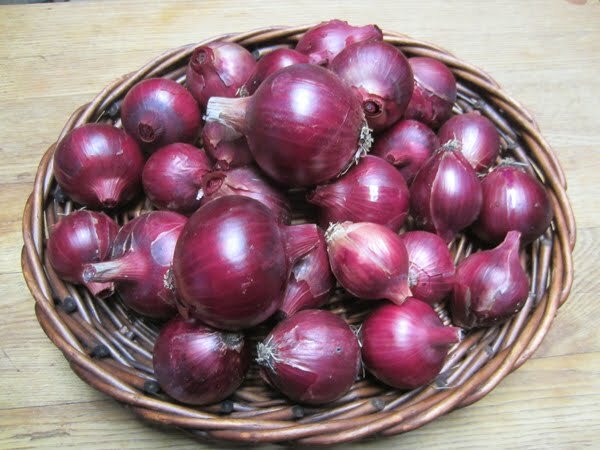 The origin of potato onions is not known, but they probably came from Europe with settlers in the mid-Atlantic states. They are still planted in the UK where they are called Egyptian onions (but are not the top-setting onions we refer to as Egyptian walking onions). The name seems to indicate their probable origin in Egypt. They are easy to plant and easy to grow. Just plant bulbs in the fall and harvest in the summer when they go dormant and their foliage dies down. They can also be planted in the spring if needed. They are very cold hardy so fall planting is not a problem in northern latitudes. They are almost trouble free, but onion thrips and onion fly maggots can still be a problem. The thrips like hot, dry weather and the maggots like it wet. They are not day length sensitive and can be grown in most areas of the US, except southern Texas and Florida. They are supposed to have a sweet, mild taste, less pungent than seed onions. And they peel easily, easier than shallots. They are productive, producing, by various estimates, 3-5X to 8-10X the quantity planted, by weight (figure 5X as an average). 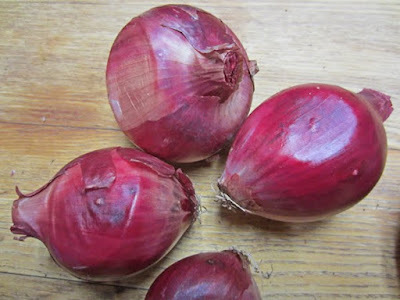 Sizes range up to 3-4 inches in diameter, which is pretty good size, big or bigger than the seed onions I grow. You get a variety of sizes from each cluster, which home cooks like but commercial growers hate. They store very well, staying rock hard into spring..
You save some of your crop for seed so they are a one-time purchase. Since the onions are grown from divisions, they tend to have a very low rate of bolting. The scape does not come from the center of the bulb, but rather from the base of the onion, so it can be removed without affecting the quality of the bulb. Planting instructions call for divisions to be planted with 1/2 to 1 inch of soil above the top in warmer climates, and deeper if grown in northern areas. Then add several inches of mulch to protect them. I plan to handle them the same way I plant my garlic. I will add compost to the beds, and supplement with bone meal, kelp meal, crab shell and rock dust. 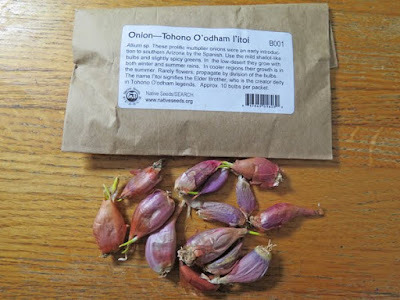 While searching for cultivation information on multiplier onions, I re-encountered Michelle's spotlight article on L'itoi onions, another rare multiplier onion. Baker Creek was still showing an out of stock message but the original source, Native Seeds, had them in stock and I ordered a couple of packets (about ten tiny onions in each packet). I figured if I have to find space for potato onions, I might as well try this one, which I hope will provide some green onions before the bulbs go dormant. That would be a nice supplement to the potato onions, where bulbs are the goal. Since it is adapted to high desert conditions, and probably does well in Michelle's climate, it may well be a challenge to get it to survive a New England winter. But if they do, given our desert-like conditions this summer, maybe they will like it here. As a back up, I plan to put a few of them in a pot to keep indoors. The bulbs are small and pinkish, with some having a bluish cast. You can see some of the bulbs are already twinned with two independent sprouts emerging. 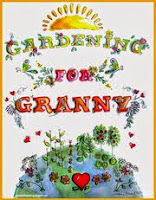 There is not a lot of planting information available, but my plan is to plant them in the raised beds with six inch spacing, or four per square, the same as I do garlic. 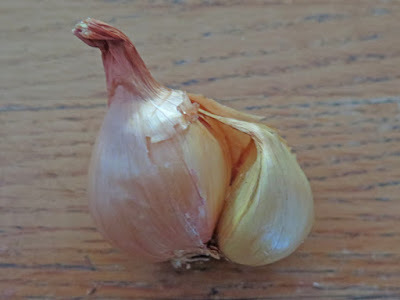 Both of these onions will go in the garden with the garlic, but it may take a year to evaluate the results. You have to be an optimist to be a gardener. Not much is coming from the garden except tomatoes. Here I did get a few beans, a Romanesco squash and the first Super Shepherd pepper. The squash is very stingy this year, with a squash per week if I am lucky. I am still picking tomatoes as they start to color, but the birds seem to have backed off a bit in their attacks. On the right, the three tomatoes at the top are Rose de Berne,then a Black Beauty and a badly cracked Pink Berkeley Tie-Dye, and my first Sunkist at the bottom. A basket of cherry tomatoes. From the top clockwise: Bing, Juliet, Sweet Treats, and Black Cherry. That is another Rose de Berne in the middle. 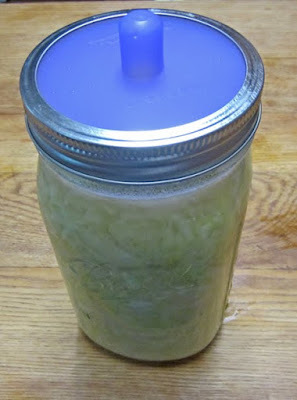 I used my four heads of cabbage to make sauerkraut. A lot of the outer leaves had to be discarded because there was mold and discoloration, so I only got a quart of kraut from about 2.5 pounds of cabbage. The jar is topped with a nifty silicone rubber lid called a Pickle Pipe from Masontops. 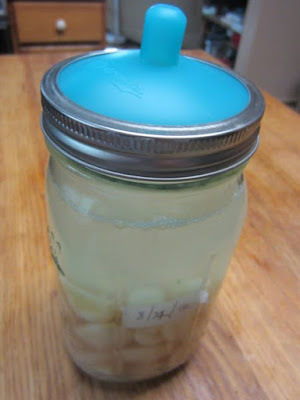 You use it with the standard band to seal the jar while it ferments. It has a tiny slit in the top of the "pipe" that releases any fermentation gases. Here is another Pickle Pipe on my jar of garlic cloves, now going into its second week of fermentation. You can see how the top is bowed out from the pressure, which I consider a good thing. It does occasionally burp some gas, but the bulging indicates that the slit is tightly sealed and only releases under enough pressure, keeping contamination from getting into the jar. I almost photographed the two jars side-by-side but decided that would look a little obscene. I also made a batch of tomato sauce from a bag of tomatoes I purchased from a farm stand. I used my Ninja Ultima blender so there was no need to peel or seed the tomatoes, just cook down for a few hours. I am not really getting enough of my own tomatoes to use for sauce, but I may roast some of the cherry tomatoes and freeze them. That's what happened in my garden last week. To see what other gardeners around the world are doing, visit Dave at Our Happy Acres, our host for Harvest Monday. 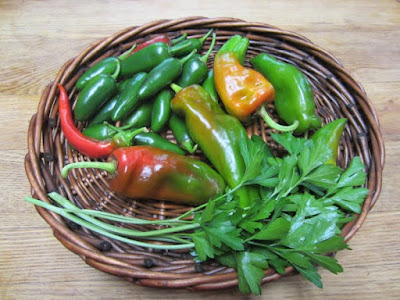 I had a few random pickings from the garden last week, including the first Jimmy Nardello pepper. 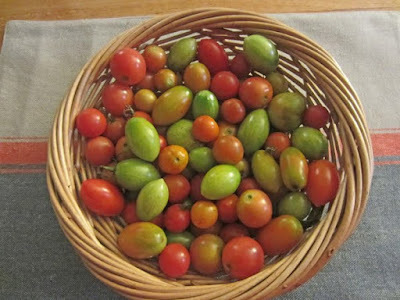 I continue to bring in the tomatoes as soon as they color a bit to save them from the birds. My mother-in-law had a suggestion for the birds. She used to hang red Christmas ornaments in the vines. The birds peck on the hard red ball and get frustrated. They eventually leave the tomatoes alone. Haven't tried it yet. 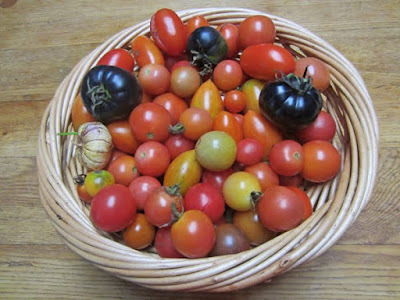 The Black Beauty tomatoes are starting to ripen on the counter and we have had a few. 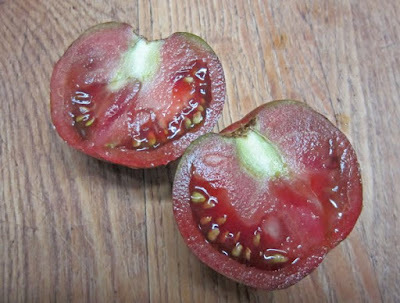 They are indeed like the Indigo series of tomatoes, where they turn black on areas of the skin exposed to sunlight and are green elsewhere. 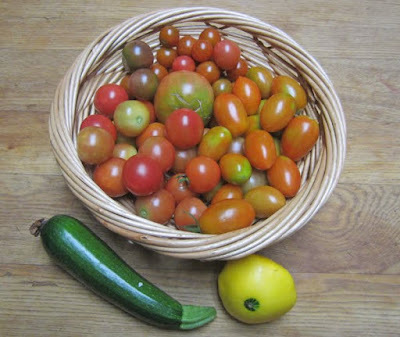 The green sections ripen to a red color. 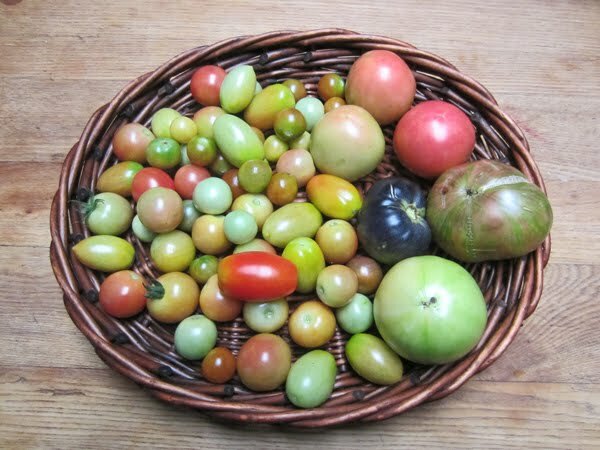 The tomatoes are tasty but not up to the hyperbole of the Baker Creek catalog. I am hoping to get one riper than this to taste but a lot of them are rotting from bird pecks so they have to be eaten sooner. I cleaned up and weighed the Red Wing onions that were drying on the back porch. It was a good crop and I got 27 storable onions weighing 5 pounds (2.3 kg.). Largest was a half pound.These store quite well, for at least 10 months or longer. Unfortunately, a significant number of onions (10 onions weighing 2 pounds, about a kilo) had what looked like soft, flat spots on them. If you press on the spot it seems hard, but I kept these separate from the storage onions and will use them first. In the garden I did get peas and spinach planted for the fall. The beds were bone dry down to the bottom so I had to re-hydrate the soil. It took 12 gallons of water to moisten 6 square feet of one bed where I put the snap peas and spinach. Unfortunately the drought continues and no rain is forecast for this week, so continuous watering of the seed beds is going to be necessary to get anything to germinate. At least the temperatures are more moderate, in the mid 80s F.
Sunday we went to the (third annual) Boston Fermentation Festival held at the Boston Public Market. I was surprised fermentation was popular enough that there was such an event. 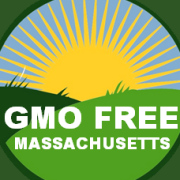 There is even a Berkshire Festival in Great Barrington in September but we will be at the MDI Garlic Festival. 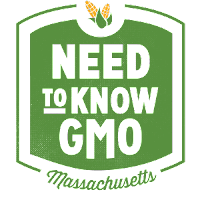 If you find one in your area and are interested in fermentation, they are worth attending. They have presentations and workshops. Interesting were the "mobs", where at various times and places they would set up a table with bowls and chopped vegetables and invite people to make their own jar of kraut or kimchi. And really nice, they had a starter sharing table where people would freely share their extra starters, like kombucha starter or sourdough starter. If you search for "fermentation festival" you will find events all over the country, and maybe one near you. That's what happened in my garden last week. To see what gardeners around the world are doing, visit Dave at Our Happy Acres, our host for Harvest Monday.